Interesting article by Felicity Lawrence in The Guardian last week – British Supermarkets at root of vegetable supply problem. On Monday morning root veg took its place alongside the prime minister’s presentation of his election campaign team. 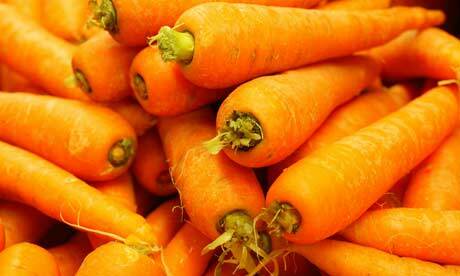 Carrots and some green vegetables might run out because of the snow, Downing street was warned. There were also problems with the national supply of milk. Just a week after the publication of the government’s report on UK food security, the record cold snap brought the fragility of our hi-tech food system into sharp focus. By today, as the ice continued its rapid thaw, it was clear that the system had held – just – but the cracks bad weather could cause had been exposed and the disputes about whether the powerful retailers or the farmers at the bottom of the chain should pick up the bill were beginning. About 80% of all supermarket supplies of carrots now come from just 10 major packers in East Anglia, Scotland and the north of England. At this time of year, more than half the carrots the UK eats have to make their way from north-east Scotland, where the fields over the past fortnight have been frozen, to centralised distribution depots and back out again to stores. The UK’s milk supply has become very concentrated too: some 60% of our fresh milk has to travel from farms around the country to six locations for processing before being trucked back hundreds of miles up and down icy motorways to customers. In Inverness-shire this week, one of the largest suppliers of organic carrots to the big retailers and a key Tesco contractor, Tio Ltd, battled the elements to get each day’s supermarket orders out “by the skin of our teeth”, according to senior manager Stephen Ryan. Whereas in the recent past the carrot harvest would have been lifted at the end of the autumn and stored, now the carrots are kept in the fields through the winter, covered with thick layers of straw and dug up just in time to meet supermarket orders day by day, Ryan said. A mixture of panic buying and demand for warming meals saw orders double just when conditions were harshest. The company brought in 25 agency workers and ran extra night and weekend shifts to cope. “We’ve managed to get all the deliveries to the depots, though some have been running hours late. There’s not as much slack in the system as there used to be, especially from Scotland, because the distances things have to travel are so big,” Ryan said. The thaw promises to bring just as many problems with harvesting as fields become waterlogged. In East Anglia, growers have also had to throw labour at the problems to keep up. Sarah Pettitt, chair of the National Farmers’ Union board of horticultural growers, estimates that her brassica company has seen a 100% increase in its costs in the cold weather, like most other vegetable growers she knows. For two weeks, Pettitt’s broccoli could not be lifted. Extra workers, mainly Lithuanian and Bulgarian migrants, have been needed across East Anglia to harvest in snow-covered fields where mechanical harvesters have been unable to work, and to run thawing lines in packhouses. Extra shifts have been on grading machines to pick out damaged and rotten vegetables. For the dairy sector, which has seen many farmers giving up their herds in the face of persistently low supermarket prices, losses resulting from the weather have been a particularly hard blow. The structure of today’s milk industry has made it more vulnerable to bad weather. The milk travels further to fewer, larger processors, which use larger articulated lorries that are less able to cope with even a slight deterioration in weather than the smaller tankers the Milk Marketing Board used to operate. “It can be mayhem even when conditions aren’t really that bad,” Tyler said. Huw Bowles, director of the organic co-operative OMSCO, agrees. “Forty years ago milk was processed closer to where it was produced and delivered back to the same area.” The drive to make industry logistics as economically efficient as possible has also removed any slack. OMSCO has cut the cost of collection by 30% in recent years with these efficiencies but at the price of less resilience. “There are no spare vehicles any more. If the driving speeds are reduced by just 10mph on a nine-hour shift because of snow, they just can’t get round the whole collection; the whole route is affected,” Bowles explained. The lack of collection has hit Liz and Chris Best, organic dairy farmers in the Cotswolds: “The yard’s been freezing, you start at 5.30am and go right through to 8pm at night before you’ve finished, checking water for the cows, defrosting machinery. You clear your driveway so the tanker can get to you and then you wait. Then you get a call saying, sorry he can’t come, and you’ve got to throw everything away before you start milking again in the afternoon. It doesn’t feel right,” Liz Best said. Sir Don Curry, formerly the government’s top adviser on ­sustainable farming and now the chair of the Better Regulation Executive, hopes that the strain a couple of weeks of cold weather can inflict on the food system will give greater urgency to calls to make it more sustainable. This week the government finally announced its delayed decision to set up an ombudsman to tackle abuses of power in the supermarket chain. However, the structure and scope of the new ombudsman’s office is to be the subject of further consultation.